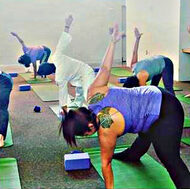 Free Yoga @ Sylmar Library! Thanks to generous donations from our Sylmar Library Friends, we have yoga mats, straps & blocks (you're also welcome to bring your own mats). No need to reserve - just come as you are (teens, 'tweens, and children are always welcome!). For more information on our yoga workouts, please call Sylmar Library at 818-367-6102. Please check with a Doctor before starting an exercise program. For ADA Accommodations, call 213-228-7430 at least 72 hours prior to event. Map to Sylmar Library, 14561 Polk St. (at Glenoaks Blvd. ), Sylmar CA 91342. Call 818-367-6102 for more information.